Sitting next to a handful of tents and spray painted signs, Antonina Scheer speaks over the sound of a physics professor giving a forum on the science of climate change. “What we want, very clean and simple, is to encourage McGill to stop investing in fossil fuel companies,” Scheer said. 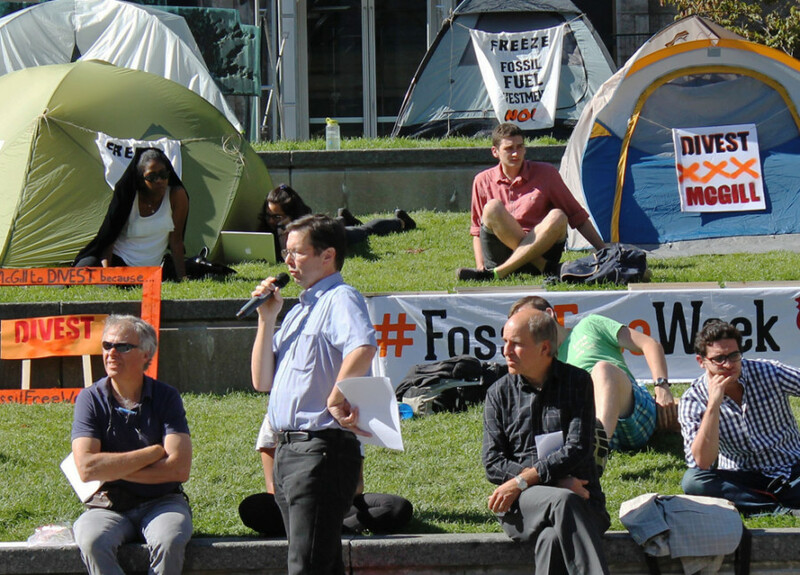 Members of Divest McGill, including Scheer, set up a camping site in front of McGill’s administration building for Fossil Free Week, which began on Sept. 21. This five-day tent city was filled with workshops, confrontations and forums demanding McGill University divest from fossil fuel companies. At a time when universities and organizations worldwide are reevaluating their hand in harmful investments, the spotlight is on McGill to address climate change. Divest McGill, the student organization advocating for resolutions to environmental and social issues, said its main focus is on environmental affairs and human rights, specifically toward McGill’s investments in environmentally harmful companies. The road that ended in the grass in front of the James Administration Building on campus was long coming. The activist group started their process towards divestment by submitting their first petition to the school in February 2013. An open letter in 2015 followed, which had more than 100 faculty members voicing their support for the university to act for a carbon free future. The process, through the many administrative steps, required real action and has thus far “not been as productive as we had hoped,” said Divest McGill member Chloé Laflamme. After more than two years of trying to influence McGill administration, Divest McGill organized the camp out as a more creative and aggressive approach in comparison to their previous actions. “[McGill is] afraid of making a political statement by divesting, but what we’re trying to show them is that by not divesting, it’s equally political,” said Scheer. Not only did they want to attract the attention of students, the camp-in targeted the Committee to Advise on Matters of Social Responsibility, which is a committee responsible for making sure McGill’s investments are socially responsible. “We’ve done everything we can to use our voice as students before using our voice as activists,” said Scheer. According to gofossilfree.org, more than 181 universities and institutions worldwide have committed to divestment. Canadian universities have not been as active; McGill would be the first Canadian university to completely divest in fossil fuel companies if Divest McGill has its way. This week alone, the number of signatures on the fossil fuel free petition has grown with the addition of more than 500 names. Supporters also came out at night. Less than 10 tents started off the week, but the number doubled in size as people learned about the cause. In November 2014, Concordia University seemed to take a step towards a fossil fuel free future by promising $5 million from the Concordia University Foundation—its biggest investment fund—to a sustainable investment fund. But according to members of Divest Concordia, a lack of transparency and action is present at Concordia as well. Divest Concordia explained that it’s unclear whether the almost two-year-old fund has divested $5 million from fossil fuels and reinvested in renewable energy alternatives. Divest Concordia member and former Concordia Student Union Vice-President External Anthony Garoufalis-Auger said the university previously told media it’s invested in 5 to 10 per cent of fossil fuel companies. “We have no idea if that money was originally invested in fossil fuels, so we have no idea whether or not it’s divested,” Ian Campbell, another member, added. According to Scheer, Divest McGill isn’t looking for the same type of partial divestment from McGill like Concordia University promised. Although a step in the right direction, the complacent type of action can affect divestment group’s drive. “I feel like that kind of stole the fire, or, how do you say, that took away the fuel for [Divest Concordia],” said Scheer. “I think some members of Divest McGill were saying like we really don’t want that kind of thing because it just shuts you down,” she said. Confirmation and transparency of funds is long overdue regarding Concordia’s actual steps towards divestment from fossil fuels and how the sustainability test fund comes into play, according to Divest Concordia. With no real word one way or another, it’s a waiting game at both campuses. Both Concordia and McGill have been called upon to act regarding their role in harmful investments. Although Divest Concordia was not a part of Fossil Free Week, their goals are the similar. “You can expect similar actions in the works,” said Divest Concordia member Marcus Peters.